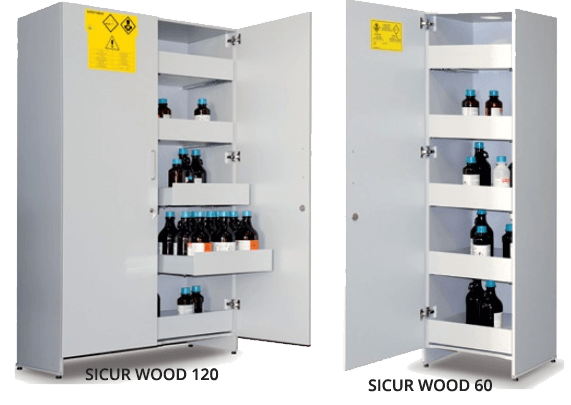 Melamine cabinet for the storage of chemical products.Predisposed for connection to a central aspiration system. Entirely produced in melamine fire-proof wood. Joint assembled body by pins and ABS edging. Palletized base for easier transportation of the cabinet. Vertical partition (just for SICURWOOD 120). 6 drawers on sliding guides. Loading capacity of the guides 30 kg. Doors opening up to 95°. Internal hinges with closing spring. Handle and security lock with key and extractable cylinder. “Product and public liability insurance” valid for all lifelong of the cabinet. Packaging with “Tipping over system ® ” device. India is innovating fast and ScienceByDesign (SByD) is here to support our scientists in delivering their best. SByD has been founded a team which has cumulative 60 years of rich experience. Get the lattest report about the project and company Profile. All right Reserved © 2015 | Science By Design.